I was so intrigued by the Richmond Tasting Menu. Every week they post their Tuesday tasting menu on Facebook and everything always sounds divine. I’ve been dying to go for ages and finally got around to going this week. I had heard that the food was gorgeous and I wasn’t let down. 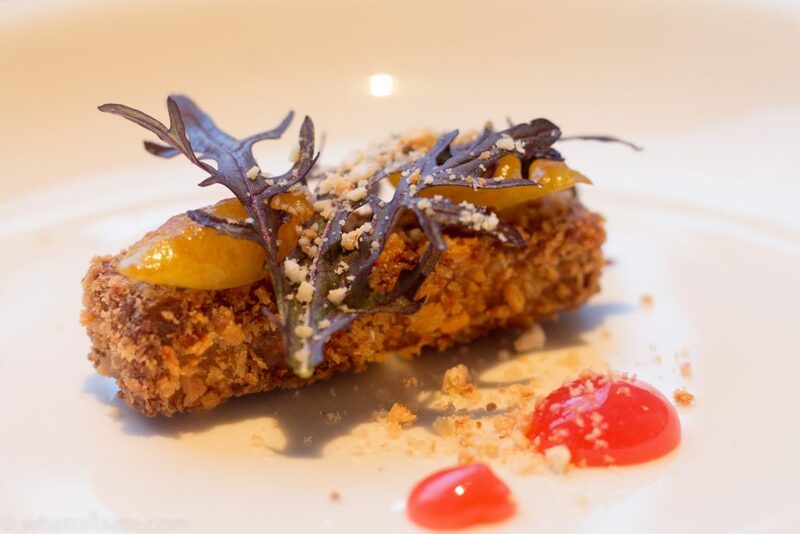 It was an absolutely fantastic meal and each dish was perfectly presented and tasted great. The tasting menu is 29.95 per person for a 5-course meal. I don’t think there’s anywhere else in Dublin offering a meal of this quality for such a low price. I went with two friends of mine (Stephen and Maria) and they were both equally as impressed with it although Stephen wasn’t impressed with me whipping out the camera to take pictures. For a Tuesday night, it was quite busy. Not packed but not empty either. The atmosphere there was good and the music was excellent. I’d recommend booking if you’re going so you are sure to get a table. 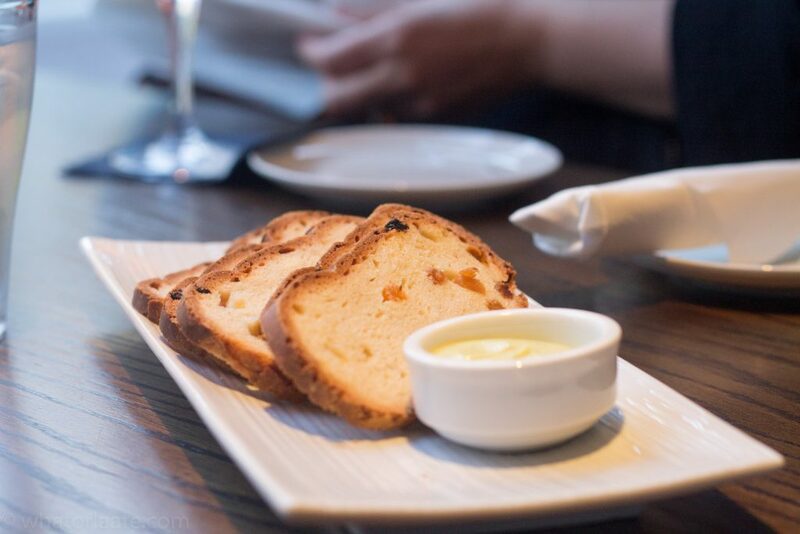 To start we were given homemade bread with raisins and a homemade garlic mayo or it could have been pesto mayo. I’m not 100% sure. The first course was Pork Neck, Black Pudding, Plum. This dish was a great start to the evening as it gave us a taste of what was coming and the quality to expect. 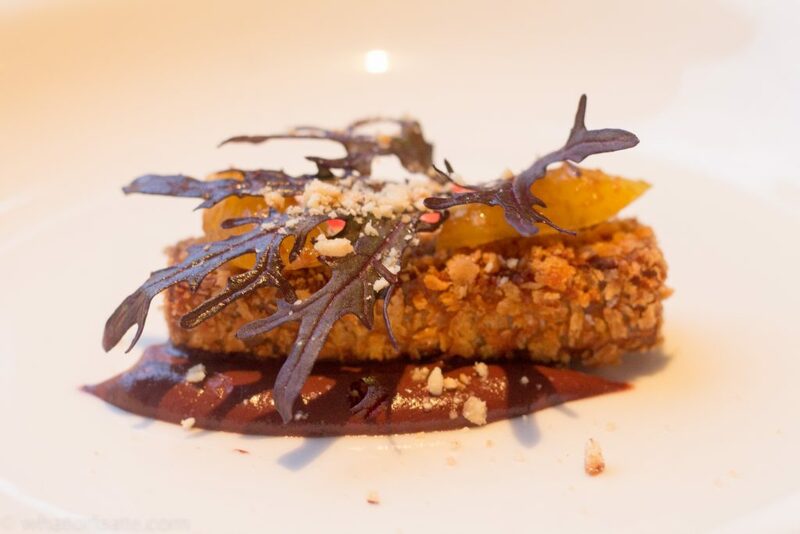 The plum sauce was gorgeous with pork and black pudding puree is always going to be a winner. The next dish was Parmesan Polenta, Tomato, Red Onion, Basil Cream. Another lovely dish but probably my least favourite of the night. I couldn’t taste the parmesan and I think dish really needed that parmesan kick to it. The basil cream however, was gorgeous, and it’s something I’ve made myself although not at nice! It was a very light dish and although it looked quite small it was just the right size. Next was my favourite of the night. 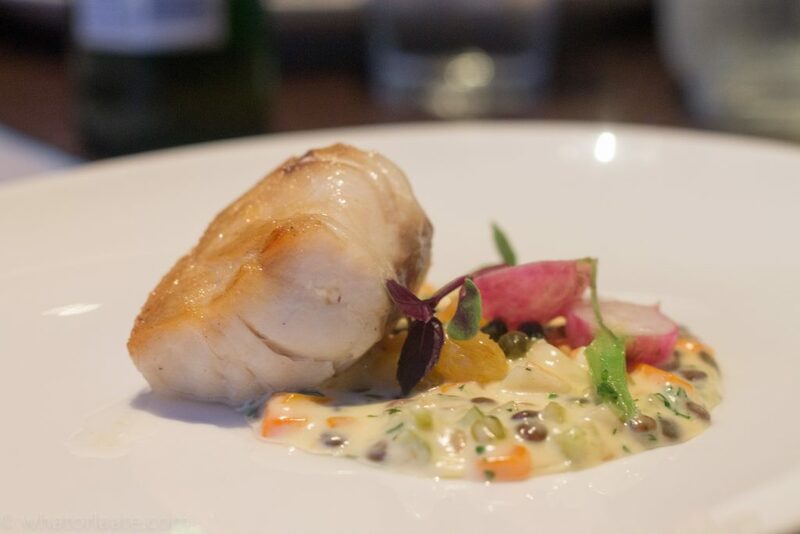 Seared Fillet of Hake, Truffled Lentils, Radish, Golden Raisins. 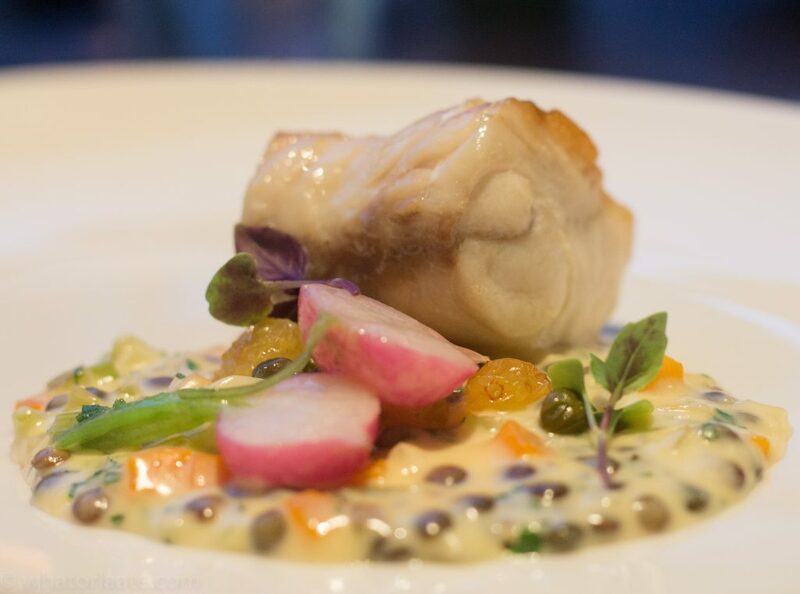 Seared Fillet of Hake, Truffled Lentils, Radish, Golden Raisins. I absolutely adored this dish. Everything about it was fantastic. If it was on their full menu I’d go back again tomorrow for it. 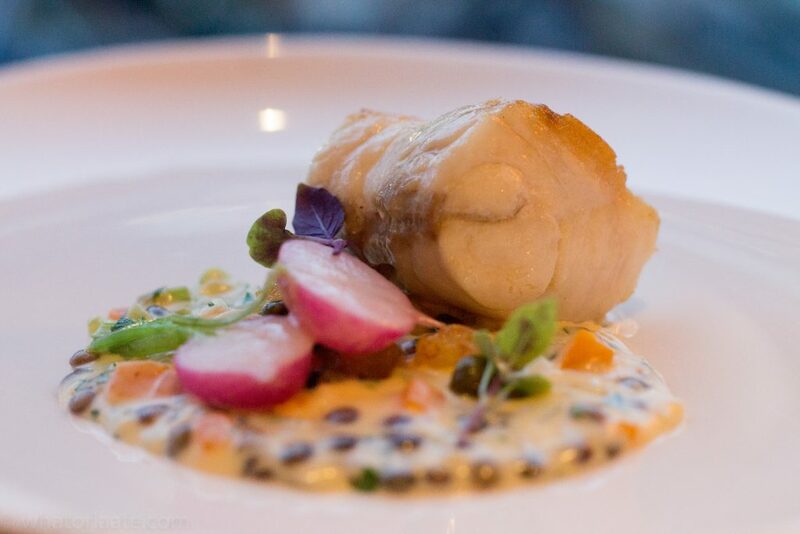 It was a gorgeous piece of fish and the sauce, lentils and raisins were melt in the mouth. The consensus on the table was that this was the nicest dish of the night and Stephen doesn’t even really like fish! 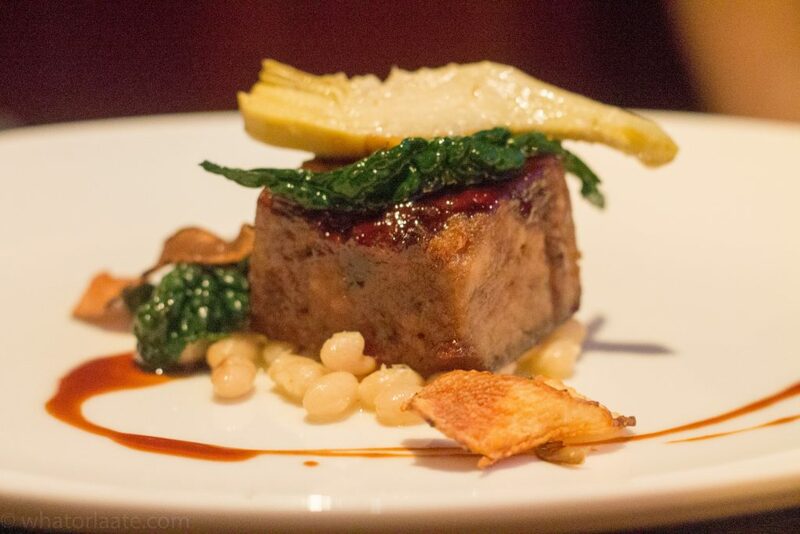 The final main dish was Pressed Veal Shin, White Beans, Cavolo Nero, Artichoke. 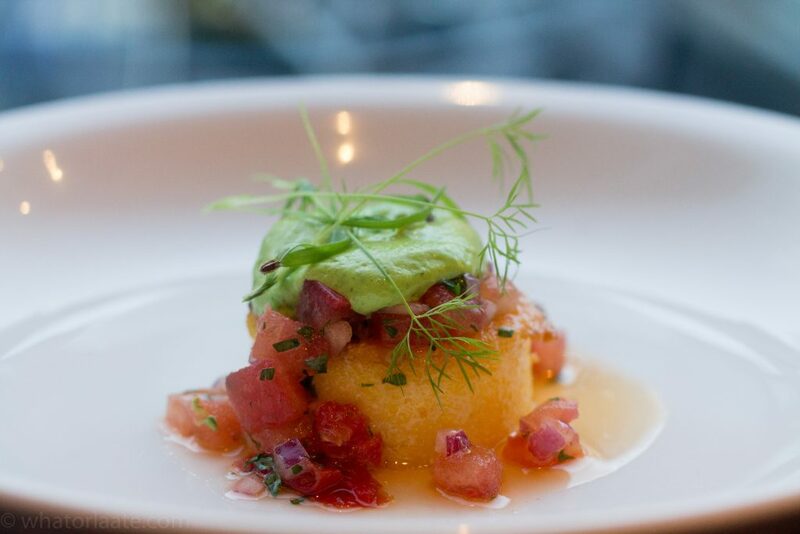 Another gorgeous dish with complementing pairings. The only criticism I have of this dish is that it could have done with a bit more sauce. I think, however, I was probably just still thinking about the gorgeous sauce that accompanied the hake dish and wanted more of it. I wasn’t sure what a pressed veal shin would be like and I expected more of an escalope type dish but this was a hell of a lot better. 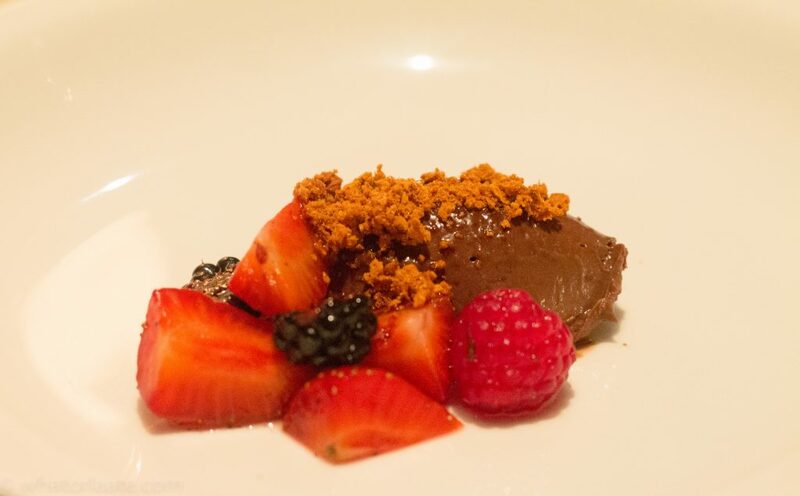 Dessert was Chocolate, Berries, Honeycomb. An incredibly simple dish that tasted just as good as it looks. It was the perfect end to the meal. I find that a lot of restaurants are making chocolate desserts with very dark chocolate and while I am a fan of dark chocolate and I’m kind of over it. I was happy that this dessert was created with a good quality chocolate that was dark enough to give it a great flavour but not so dark that you’d need cream to go with it. The honeycomb was freshly made and gave the dish a nice crunch. To go with the meal we ordered Aperol Spritz. I didn’t like it. 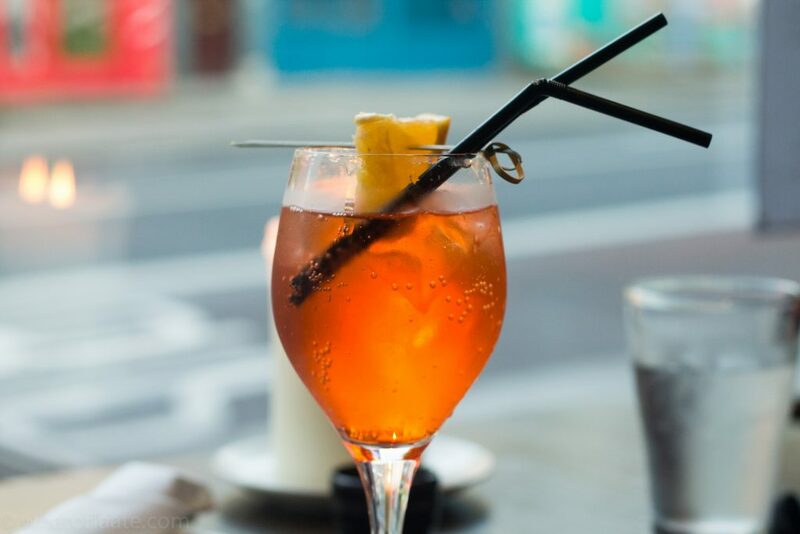 I’d go as far to say I hate Aperol spritz but I’m not a massive drinker and if you like them I’m sure this was a lovely one. Just wasn’t for me. It does, however, look very pretty so here’s a picture of it anyway. Would I go back to Richmond Restaurant? Absolutely! I’m already trying to figure out when I can go again. It’s on my list of places I’ll be highly recommending people to try out. What did I not like? Just the cocktail. Couldn’t fault the food for the price. *Update* I went back and it was even better than the first time.